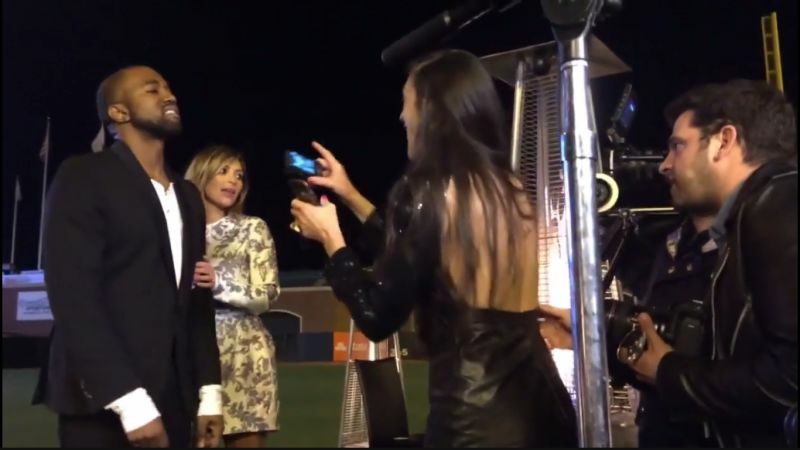 The Kardashian Klan was no doubt hoping to keep all the footage from Kanye and Kim's "Proposal in the AT&T Park" under wraps until such time as they could profit from it, but thanks to the co-founder of YouTube of all people, the crux of the ceremony is now online. Chad Hurley was among the who's who of nerds who attended the lavish affair, and of course he was filming it from the stands. In a two-and-a-half minute MixBit clip, Hurley captured the gist of what went down: Kanye proposing; the family members pretending to be happy for someone other than themselves for a change; Kris Jenner "bopping up and down" to "All of the Lights" while Jaden Smith frolics nearby. Jeweler-to-the-Stars Lorraine Schwartz, known for her overly generous diamond portions, can also be seen toasting the happy couple, insisting to Kim that she's "thrilled Kanye's in your life and vice versa." This will be Kim's third marriage in ten years.